Today, I get to go sailing out in Boston Harbor on a 40' boat! I have never been out on the harbor and this is a glorious gift from our daughter and son-in-law to my husband for Father's Day. I get to go along because I had something to do with making him a father! We are a little late because of busy schedules (theirs then ours) and then weather (rain, rain, hurricane, rain) and finally we get to go. The weather is stellar. I saw it first on Timber and Lace but they linked through to a tutorial on The Painted Hive which is where the photo came from. Below is the one created by Timber and Lace. I have been looking for a natural wreath idea to replace a wreath on our family room hearth. Because I am just about ready to leave for sailing I won't have time to photograph it so maybe later you'll get a before and after view. 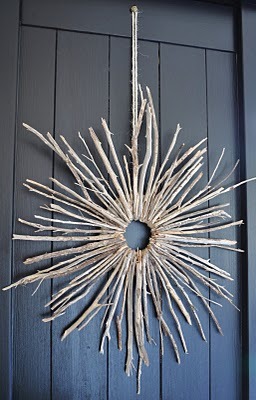 My hope is to collect bleached white driftwood, dry it out and build a sunburst wreath like this one. I'll keep you posted. Enjoy your holiday weekend. I hope the weather is glorious where you are as well. Funny timing. 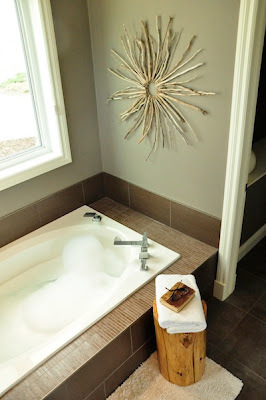 I was just writing a feature post about The Painted Hive today (for next Monday) and came across that branch wreath. She is very talented!